I today submitted a fully revised Project proposal for my M.A. R.P. (part-time) under the new Subject area of Fine Art. This attached below in pdf format and is also available on ‘Proposal’ page above. I now know ( January 24th) that this has been accepted and I move on to the ‘Development’ phase. A useful page of lnked resources (mostly google books) from course at Westminster. N.B. a good few of the links given are broken and the Google Docs links are to limited view documents. Cut and pasted here as useful source material in building new bibliography for amended proposal. Art Practice as Research: Inquiry in the Visual Arts (2005 edition). SAGE. Barrett, E. & Bolt, B. (2007) Practice as Research: Approaches to Creative Arts Enquiry. I.B.Tauris. Interesting (almost complete) sections available via google books include Introduction; Very useful: Appendix. 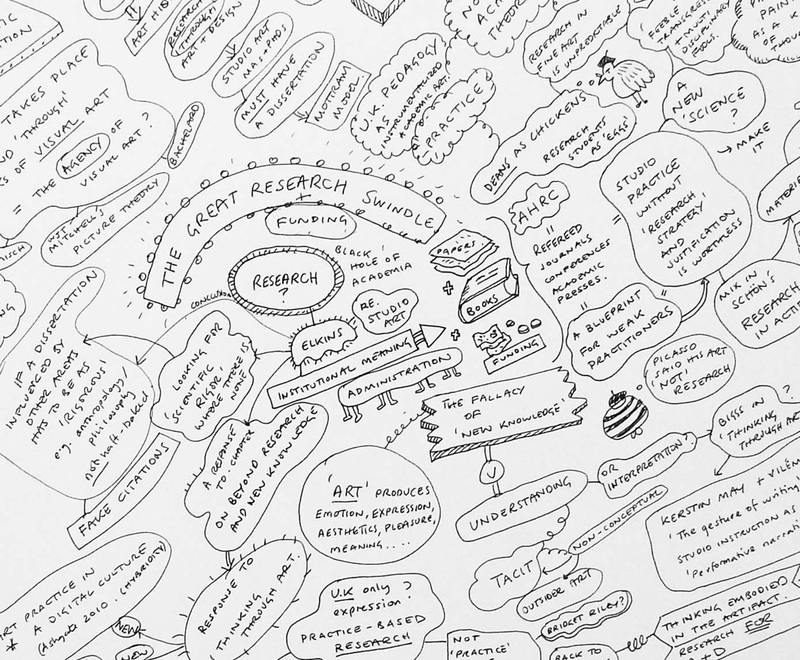 Developing and writing creative arts practice research: a guide. Linda Candy 2006 Practice Based Research: A Guide. Sydney: Creativity & Cognition Studios, University of Technology. Differences between the two types practice related research: practice-based and practice-led. Balkema, A.W. & Slager, H. (2004) Artistic Research. Rodopi. What is the Point of Research and Doctoral Studies in Art? Henk Borgdorff, 2010: Artistic Research as Boundary Work, pages 4-11. In How does Artistic Research Change us? Proceedings of CARPA 1 – 1st Colloquium on Artistic Research in Performing Arts. Theatre Academy, Helsinki November 19.-21., 2009 Performing Arts Research Centre, Theatre Academy 2010. ISBN 978-952-9765-59-1. Previously published in: Corina Caduff, Fiona Siegenthaler and Tan Wälchli (Eds) Art and Artistic Research / Kunst und Ku?nstlerische Forschung Zurich Yearbook of the Arts / Zu?rcher Jahrbuch der Ku?nste, vol.6, pp. 72-79 Zu?rcher Hochschule der Ku?nste (ZHdK) and Verlag Scheidegger & Spiess, 2010. Michael A R Biggs “Learning from Experience: approaches to the experiential componenet of practice-based research” in: Forskning, Reflektion, Utveckling. Stockholm, Vetenskapsrådet, 2004, 6-21. Online version. Leavy, P. (2008). Method Meets Art: Arts-Based Research Practice. Guilford Press. Download the sample chapter Social Research and the Creative Arts An Introduction from the editors’ site. and design. Aldershot, Hants, England; Burlington, VT: Ashgate. Miles, M. ( 2005). New Practices, New Pedagogies: A Reader. Routledge. Carter, P. (20050, Material Thinking. Melbourne University Publishing. Kester, G.H. 2004) Conversation pieces: community and communication in modern art. University of California Press. See also:Grant Kester Conversation Pieces: The Role of Dialogue in Socially-Engaged Art. Miles, A. (2008) Virtual Actual: Hypertext as Material Writing. . Studies in Material Thinking 1 (2). Retrieved November 30, 2008. Ross, T.(2008) Material Thinking: the aesthetic philosophy of Jacques Rancière and the design art of Andrea Zittel Studies in Material Thinking 1 (2). Retrieved November 30, 2008.